Loot Crate Reviews: Is This Fandom Subscription Worth It? Loot Crate is a subscription company that offers curated collections of apparel, memorabilia and more for numerous comic book, video game, movie and TV fandoms. Loot Crate Review: Is This Fandom Subscription Worth It? For self-proclaimed nerds and superfans, Loot Crate promises to provide you with a curated collection of apparel and memorabilia from some of the world’s best pop culture franchises on a monthly, bimonthly, or quarterly basis. According to their website, Loot Crate was founded in 2012 and remains the worldwide leader in fan subscription boxes. The company states that they delivered over 14 million crates in their first five years and that they partner with industry leaders across entertainment, gaming, and sports culture to offer curated collections of exclusive content within a variety of niches. Loot Crate’s website tells us that they are a company run by fans, meaning that they work hard to seek out the “holy grail” collectible pieces for their crates to create a memorable experience for every looter. Will a Loot Crate subscription satisfy your inner fan, or are you better off going in a different direction? We’ll work through the details here. How Does a Loot Crate Subscription Work? At the time of writing, Loot Crate offered a variety of crate subscription options designed to appeal to a broad spectrum of fandoms. Most crates are delivered on a monthly, bimonthly or quarterly basis, though a few are one-time, limited-edition boxes. You can also order the crates as a gift subscription that won’t auto-renew after expiring. What Options Are Available with Loot Crate? Below are the categories of loot crate options that were available when we completed this research. Each crate we looked at also had a $5 shipping charge per delivery. The prices listed below are for a month-to-month subscription, not the prepaid six-month or annual subscription prices which are offered at a slight discount. Loot Crate ($19.99/month): This surprise monthly bundle of exclusive items from movies, TV shows, games, comics and more has an estimated $45 value per crate. Each month is themed, and subscribers can opt out of certain months if they aren’t interested in the theme. Loot Crate DX ($46.99/month): DX provides a higher-caliber assortment of collectibles, apparel, and home goods, valued at over $75 per crate. Loot Wear: This apparel-only collection gives you the option to choose from five apparel subscriptions (socks: $9.99 per month, undies: $10.99/month, wearables: $17.99/month, ‘for her’: $19.99 per month, tees: $11:99 per month). Loot Anime ($28.95/month): Valued at over $60 per crate, Loot Anime is a monthly delivery of exclusive anime and Manga collectibles and gear. Loot Fright ($24.99): This frightful crate delivers horror-themed collectibles and apparel every other month. Loot Remix ($14.99): Remix crates offer a surprise collection of past Loot Crate collectibles and gear (delivered monthly). Loot Gaming ($28.98): This exclusive monthly delivery of collectibles and gear is inspired by popular video games and is valued at over $60 per crate. Halo Legendary Crate ($36.99): Subscribers will receive bi-monthly deliveries of cutting-edge gear, exclusive Halo figures, apparel, and in-game items. Fallout ($34.99): The Fallout crate contains cutting-edge collectibles and gear with a Fallout theme, every bi-monthly shipment comes with a piece of Liberty Prime to build the full figure. The Elder Scrolls ($49.99): Exclusive Elder Scrolls gear, each crate comes with a piece of an exclusive figure series delivered quarterly. God of War ($49.99): This crate offers exclusive God of War themed gear and collectibles delivered bi-monthly. Loot Play Digital Games ($11.99): Subscribers gain access to digital deliveries of five Indie games each month. Deadpool ($34.99): This quarterly subscription gives you a collection of unique Deadpool collectibles, home goods, and apparel. Marvel Gear and Goods ($36.99): You’ll receive Marvel-themed gear and home goods delivered bi-monthly. WWE Slam Crate ($34.99): This crate comes every other month and contains official WWE items like apparel and collectibles, as well as an exclusive enamel pin in each shipment. Sanrio ($39.99): With this subscription, you’ll get a crate every quarter of collectibles and apparel celebrating Kawaii Sanrio characters like Hello Kitty. Wizarding World Crate ($39.99): A bimonthly subscription of licensed collectibles, apparel, memorabilia and more with a Harry Potter theme. Firefly ($41.99): This collection of exclusive Firefly collectibles, gear and apparel ships out every other month. Star Trek ($39.99): Subscribers will receive an official collection of Star Trek collectibles, apparel, and prop replicas delivered bi-monthly. Lord of the Rings ($49.99): This three crate trilogy celebrates The Lord of the Rings, and customers have the option to purchase one or all three. Star Wars ($59.99): This limited-edition crate provides you with authentic apparel and accessories from the movies (not a subscription). Sports Crate ($29.99): Subscribers will receive sports memorabilia, based on their chosen MBA team every other month. Signing up for a multi-month subscription instead of a month-to-month one can save you at least 10%. For example, a one-year subscription for a Loot Crate averages out to $15.95 a month instead of the $19.99 you’d pay month-to-month. The Loot Crate brand also offers a range of merchandise for sale in the website’s Loot Vault. Some of this apparel, action figures, and other memorabilia are also provided in subscription boxes, while others are unique to the Vault. What Is the Loot Crate Refund and Cancelation Policy? According to their website FAQs, Loot Crate permits customers to cancel their subscription at any time through their online account. They state that you will still receive any remaining crates credited to you at your most recent renewal, but that your subscription won’t renew once they are fulfilled. You won’t receive a refund when you cancel your subscription, and the company only accepts returns in cases where items are missing or come damaged. A few Loot Crate options let you skip a month without impacting your account, including the classic Loot Crate, Loot Crate DX, Loot Wear, Loot Anime, and Loot Gaming. The company states that it’s not possible to skip shipments of their bi-monthly or quarterly crates. You can direct any further questions about Loot Crate to the brand’s customer service representatives through their contact page. What Do Previous Customers Think of Loot Crate? Does Loot Crate offer a good value for the price? We found that looking at reviews that previous customers have posted on Trustpilot, Influenster, and Review.IO is an excellent way to find out. Overall, we found that these reviews don’t paint an overly positive picture of Loot Crate. We read through dozens of reports from previous customers who complained that their crates arrived weeks after expected, meaning that they rarely came in time for the birthdays and holidays they were ordered for, even when the orders were placed two months in advance. We also noticed numerous incidences where customers tried to place orders but never received shipping confirmation, and found out weeks later that the order was never processed. Several long-term subscribers also complained that they thought the quality of products within each crate had deteriorated over the past year and that they weren’t getting enough value to justify the cost anymore. A few people also said they struggled to cancel their account before their subscription auto-renewed and were frustrated that Loot Crate didn’t refund any of their money. That being said, we also read numerous recent reviews from customers who loved their crates and wanted to continue subscribing. While many of these reviewers also mentioned the slow shipping times, they didn’t consider it a deal-breaker. The overall perspective we noted from these reviewers was that Loot Crate was inconsistent in product quality and delivery promptness. While many subscribers loved the products they received enough to overlook these details, others were left unsatisfied. We can’t tell you whether you’ll like the products in your Loot Crate enough to ignore these red flags, but it’s important to keep them in mind. What Subscription Companies Are Similar to Loot Crate? Should you consider another nerd subscription box beside Loot Crate? Below are some of the brand’s most significant competitors and some information about how they stack up. This chart shows that Loot Crate has plenty of competition when it comes to fandom subscription services. Each of these four companies promises to provide exclusive merchandise within their boxes, though they each offered a relatively similar collection of products and fandoms (except for Kawaii). One way that Loot Crate stands out is with the number of crate options available for subscribers. Customers have the opportunity to select the standard Loot Crate and receive a different theme each month, or they can commit to over a dozen different quarterly and bi-monthly subscriptions for a range of products from the same fandoms. We think this range of options from Loot Crate gives subscribers a better chance of receiving products they are personally interested in, which likely makes it the best option for those with specialized fandom preferences. Others might be happier with the less specific merchandise available from the other brands. Our View: Is Loot Crate Worth the Money? Looking at the details behind Loot Crate, it’s clear that this brand offers a subscription service that’s designed to appeal to a broad audience. We think Loot Crate earns points over its competition for the full range of crates they have available. Customers can choose precisely what fandom they want to receive products from, and they can also skip months that they aren’t as interested in. However, the reviews we read about Loot Crate show that many people find the service to be lacking, primarily because of slow shipping times, unprocessed orders, and too many low-quality products in each crate. Many of the reviews we looked at showed that some long-term customers thought that the quality of each box was going downhill and that Loot Crate orders often arrived months behind schedule, especially during the holidays. Does Loot Crate make sense for you? Though we read more reviews from unsatisfied customers, many subscribers still made it clear that they truly loved this company. 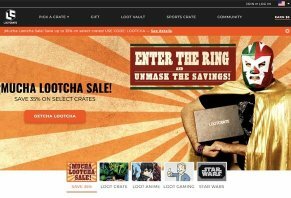 Loot Crate appears to be a convenient way to source unique apparel and memorabilia from over a dozen popular fandoms, and the company offers potential customers the flexibility to choose what they are interested in. If you’re interested in trying Loot Crate, we recommend signing up on a month-to-month subscription basis at first so that you can determine whether you love the loot before you are locked into a six-month or twelve-month nonrefundable subscription. Write a Review for Loot Crate!